It's only a few degrees less than last night, but what a difference it makes. Goodnight everybody. Regarding all the super hot weather.....I will take the cold over that heat any day. Those temps in Australia would do me in. As much as I dislike the cold, I agree with Kathy. I can dress warmly for cold but after taking everything off I can still be hot when it's hot. all. Sorry, Kathy and Wolf, I prefer summer. I know someone's going to shoot me - I prefer spring! Everybody!! I'm spoiled. In Napa we only have water in the winter, close enough to San Francisco bay to have few really hot days. Perhaps I should have been more specific: I prefer Spring and Fall, then Summer, and in a distant last, is Winter. Morning all, I've never had a flower on my Aloe Vera. I prefer our winter as I can sit outside in a protected spot out of the cold wind. It sure is a strange flower on that Aloe Vera. 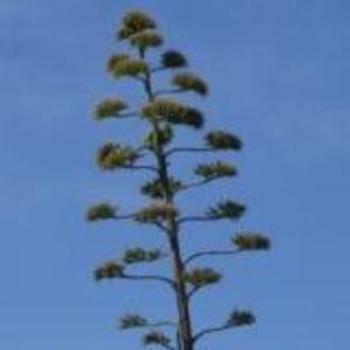 It looks a little like a branch of a fir tree. After 4 days of 40 degree heat we are looking forward to a maximum of 33 degrees today. Still too high, but moving in the right direction. I hope your weather is appropriate for solving a POOZLE. You're a candidate for the Darwin awards, Arachnid! Wonder where Keith is....should I wait or not.....Nah! Pounce....ambles off humming to ones self! What else would you expect from a man who just cooked a thousand wieners?? Arachnid, the main difference between us is I didn't fall off of a ladder. Lots of dead wasps and a demolished nest - check. I'm waiting for a 'snag report'. I am in communication with Wombat about another word that was changed without necessary changes in the missing pieces, but y'all can go ahead since the problem is easy to spot, I think. I did not know aloe vera plants could be large enough to have such huge flowers. Aloe megalacantha grows as a shrub! Whaddyaknow. I know aloe best as a plant folks have in small pots in the kitchen, to use in case of a burn. As I have a sore throat with a 'tickle' I think a tonic is in order. It is 36 degrees at the moment and still rising. We could do with some of the topside coolth. Oooh, I get to bring us to the bottom of the page . . . I guess I better hurry along before someone else comes . . .